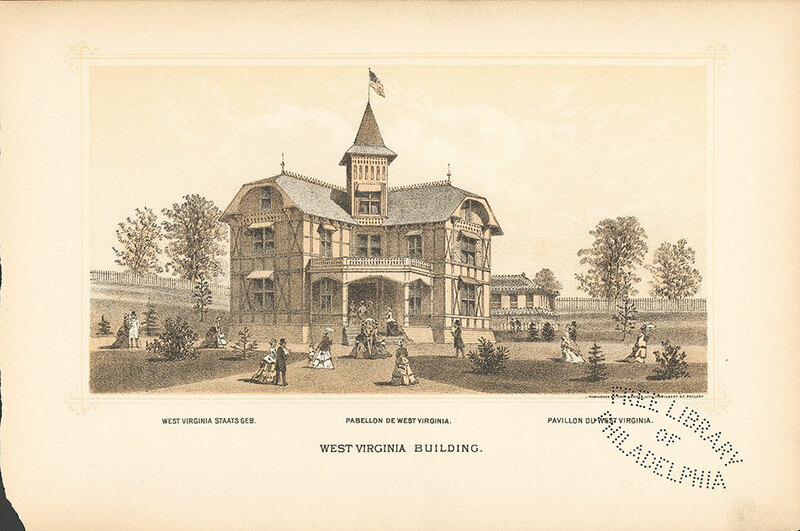 Notes: "West Virginia Staats Geb., Pabellon de West Virginia, Pavillon du West Virginia." Wisely the authorities of the State of West Virginia resolved to unite in the building prepared for their accommodation the double feature of a mansion for the reception of friends and strangers and an exhibition hall. In the great buildings on the grounds this State could make but little figure among the exhibitors in the American department. Its productions, which are nearly all natural, would stand but little chance for examination alongside of fine manufactured goods, objects of art, and ingenious machinery which older commonwealths might present. A special building of its own, in which the varieties of the bounty which nature has bestowed upon the State could be shown, would attract most attention, and the effect would be more permanent upon the memories of those who might examine the products. For this reason West Virginia is represented by two buildings. One is the State headquarters, of about 40 x 40 feet, two stories in height, and built upon a ground plan which places it diagonally in position with the exhibition-hall, which is behind it. The main building, in comparison with that which it adjoins, might be said to be shaped like the letter /\ -- a seeming result, however, from the manner in which it is placed. This house is two stories in height. It has been constructed, with great care, of native woods, neatly paneled, and with the framework arranged so as to show the varieties in color and grain. From the point at which the angles of the front building meet rises a small cupola, surmounted by a spire. The interior is nicely fitted up and arranged, and near the door is an inscription, “West Virginia welcomes all; the latch-string is always out.” The main building is of a dimension of 30 x 59 feet, and built entirely of West Virginia woods. The exhibition-room is a plain parallelogram of 40 x 60 feet, which is filled with specimens of the stone, ores, coal, wood, sands, oil and mineral waters which the territory of the State furnishes. The vegetable products are illustrated by tobacco in leaf and manufactured into cigars and snuff. The cereals are numerous, and the soil upon which they grow accompanies the specimens, so as to give the fairest idea of its rich and fertile character. There are over 80 varieties of wood displayed on a pedestal in the centre of the hall; a rough and a polished specimen are placed side by side. The granite and marble and building-stone show great variety and beauty in color. Coal in diversity is displayed not only in the building, but in pillars outside on the grounds. The public-school system is also illustrated by specimens of the books and apparatus used, with maps and other examples. The petroleum product of this commonwealth is large, and care has been taken to show the variety of light and heavy oils. The substances which are used in forming mineral paints are plentiful, and there are specimens of fine sand for making glass, and of marls valuable in cultivation and equal to those of New Jersey. The display is one which must convince all who examine it of the immense mineral wealth of the State, and of the value of its vegetable productions. It only needs enterprise and capital to show that this commonwealth is one of the richest in the Union. The situation of these structures is adjoining and immediately east of the Spanish building, north-west of the Catholic fountain, with Arkansas as an immediate neighbor. Notes: The West Virginia exhibition, main building and exhibition hall, situated in a landscaped field with fence and trees in background. People stroll in the foreground.